Your relationship is totally unique — one of a kind, perfect for you and your best beloved. Shouldn’t your wedding jewelry be the same way? Increasingly, couples across the nation are seeking to really personalize their weddings. Perhaps it’s in response to the troubled times we live in — economic uncertainty, wars, and environmental disaster — that we’re turning to the most basic aspects of our lives for comfort and celebration. What could be more central to our lives than marriage? No longer are couples bound by the traditional choices of a simple gold wedding band or a solitary diamond to mark an engagement. Using fine design and the jeweler’s art, many couples are opting for wedding jewelry that reflects their personalities or passions. 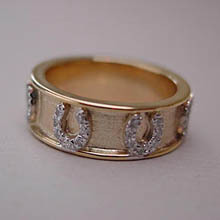 This is certainly true for the horse lovers, who are blessed with a wide range of wedding ring options. This beautiful 14 K gold wedding band style ring is perfect for the horse lover: .33 cwt of diamond horseshoes surround the band, adding the perfect touch of sparkle and flair while evoking the timeless beauty and meaning of the traditional wedding band. There’s even more flexibility when it comes to engagement rings. One emerging trend is the use of smaller diamonds for engagement rings, often accented by other, perhaps smaller, gemstones. 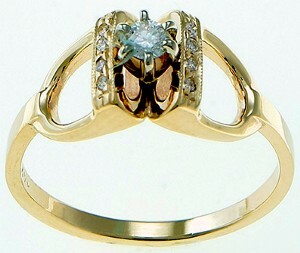 The flash of color that rubies, sapphires or emeralds can provide adds a new dimension to the engagement ring. Additionally, design can say so much about the bride to be. 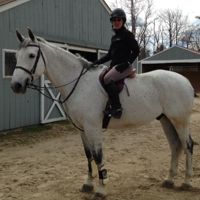 The bride who wears this ring is clearly someone who appreciates style and everything equestrian. One lovely diamond in the center of a stirrup ring set with pave diamonds, it’s a distinctive, memorable and eminently appropriate ring — perfect if you’re planning to pop the question during a moonlight ride!